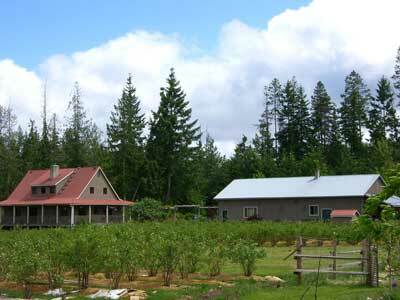 Our beautiful Bed and Breakfast in Qualicum Beach near Errington, Parksville, Cathedral Grove with organic blueberries. Blueberry Fields Bed and Breakfast Welcomes YOU! $15 for each additional guest. $10 for each child; children under 2 are free. In some cases, we will accept small dogs for $5/night. 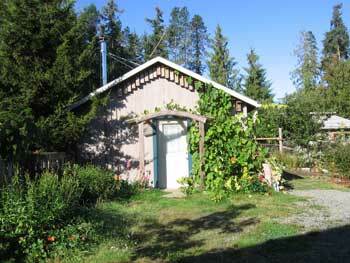 The Blueberry Cottage has two rooms with a queen sized bed in the bedroom and a double sofa bed in the living room. A twin mattress can be moved in when needed. • Feel free to call us for last minute availability. We often have one or two nights open, even in the busy season. • Reservations are recommended. We are happy to make reservations for two nights or longer. • We ask for a deposit of 25% of your stay. We charge $5 more to make a reservation for one night. Full refund 30 days before your stay. Partial refunds closer to the date of arrival. Ask for more details. We do not make your breakfast, but we do provide all the makings so you can make a delicious country breakfast at your convenience in your own kitchenette. Farm fresh eggs, toast & jam, coffee and tea & blueberries in season. We welcome and look forward to meeting you!